I’m excited and proud to serve as President of NAMI-NYC Metro’s Board of Directors and again leading the Stigma Busters Team. This year is our 13th Anniversary NAMIWalks NYC event on May 11th at the South Street Seaport/Brooklyn Bridge. 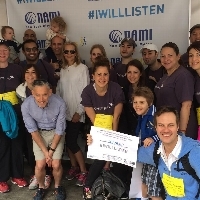 The funds raised through the walk provide funding for NAMI-NYC Metro’s no-cost support, education, and advocacy services for families and individuals living with mental illness. As a family member, I know how important NAMI's services are. I only wish I was aware of NAMI when as an only child I was faced with the responsibility of helping to care for a single parent suffering from bipolar disorder. NAMI-NYC Metro is a welcoming community of support for people living with mental illness and their families and friends. Our programs are an essential boost to care and treatment, offering support groups, classes, lectures and social time together, all at no-cost to the user. I hope you make a donation towards my walk effort and join me join us on this special day aimed at raising awareness of ALL mental illness and to raise much needed funds to support those living with mental illness, and continue to erase the stigma that creates a barrier to accessing care. The larger the crowd the louder the voice. Also, please forward this to your network of friends and colleagues that you think are interested in joining the fight against mental illness. Sponsorship Opportunities are also available, for more information on Sponsorship and branding partner opportunities, please contact Sarah Sheahan: ssheahan@naminyc.org or 212.684.3365 ext 207. Thank you for all of your generous support and I look forward to seeing you there!